Ask any suite renter why they chose the path of independent contracting, and one of the most common answers you will hear is that they were seeking freedom. Let us give you a broader picture of what that freedom looks like and how suite renting can be an enriching career choice! Worried that you may not be able to make the full transition alone? Don’t worry! Salon Independence is here to support our stylists as they grow their business. We do everything possible to help create a relaxing and positive experience for both our stylists and their clientele. Renting a suite means being in business for yourself, not by yourself! With professional marketing assistance and business support from our President, Jon Haigwood, we back your career from the start. Salon Independence has tailored its brand to be professional, inviting and chic! We strive to offer a better salon experience for our professionals and their clients. This brand image is reflected on our website and in our social media presence. New clients will be able to review online profiles of our stylists, see examples of their work and read testimonials to help them find their perfect stylist. Maybe we’ve got you thinking about suite renting, but you’ve still got a lot of questions. Starting a new business venture can seem a little overwhelming, so we totally understand! 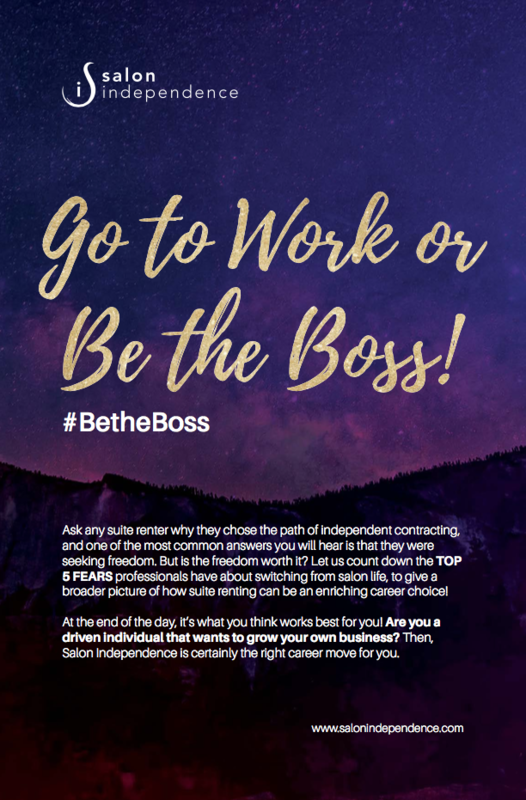 Click the Download Now button to the right for our free brochure, which gives a more detailed look into what suite renting with Salon Independence can do for your career. Hopefully, we have been able to answer a lot of your questions. If you would like to learn more, please call, text, or email Jon at your convenience. All communications are confidential.